More evidence has emerged that Windows RT tablets are going to priced on the cheaper side. The latest report, this one from Lenovo North American head David Schmoock, claims that Windows RT tabs will sell generally for $200 to $300 less than tablets running the full version of Windows 8. Schmoock pegs full Windows 8 tablets at $600-$700, putting the stripped-down Windows RT devices around $300 on the low end. That's slightly higher than what was predicted Tuesday in a report claiming that the Microsoft Surface will sell starting at $199 when it launches in October. "RT will play in consumer and retail at very aggressive price points," Schmoock told Bloomberg. "It will do well but it's going to be more of a consumer price point play to begin with." Windows RT will come on the ARM-based version of the Microsoft Surface, with a full version of Windows 8 running on the more expensive Microsoft Surface Pro (with its x86 chip). 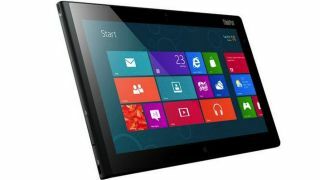 Meanwhile, Lenovo is set ride the very first wave of Windows RT tablets, as ordained by Microsoft and Nvidia, with the ThinkPad Tablet 2 launching in October. It's worth noting that Schmoock may be speaking only about Lenovo's upcoming Windows 8 tablets, like the Lenovo ThinkPad 2, and not making any predictions about the rest of the industry. But Lenovo's CEO also recently claimed that the Chinese company provides "much better hardware" than even Microsoft. Either way, the Microsoft Surface and other Windows RT tablets will certainly attempt to undercut Apple's iPad, the current king of tablets, while full Windows 8 tablets will market as more capable devices at steeper prices.